While the very idea of DJing on a mobile device is for some heresy and others a miracle, one issue has blighted the platform for a long time. Having only a single stereo output meant that performing the somewhat essential DJ function of cueing the next track in your headphones has necessitated splitting the stereo signal into a pair of mono ones via products like the Griffin DJ Cable or a cheap £2 splitter from eBay. There was also the wider issue of earlier versions of iOS simply not being able to handle more than a single stereo output anyway. But along came iOS 6, and with it came Apple’s commitment to make pro audio more of a reality on iOS platform. Suddenly iOS specific controllers were dishing out full stereo master output and cueing. Yay. But not everyone wants or needs a full controller, so Griffin has decided to make proper stereo output and cueing a reality for iOS devices. Oh and for Apple computers too. The Griffin DJ Connect is a bus powered dual stereo audio interface that works driver-free with iOS and OS X. It delivers true stereo headphone cueing and master output, along with a large volume control. Given the application, the Griffin DJ Connect needs to be small. And it is, coming in smaller than a credit card, and about an inch thick. It’s certainly a distinctive little box that takes some design cues from high-end audio interfaces such as the Focusrite Forte and the Apogee Duet, albeit smaller. The DJ Connect is all plastic, but somehow it’s still quite weighty for a small box. From the shiny volume control, to the rubberised body, and the yellow rubber base, it feels solid. The big shiny wheel has a degree of wobble when moved, but this isn’t a controller so I’m not that bothered. I do like the yellow light under the wheel to show it’s powered up. The wheel is also notched, which does add a degree of control to the fully rotary encoder. On seeing those words, and the form factor, I should point out that this has no MIDI, nor should it, but I can’t help but feel that someone would have asked. This won’t take long. You get a stereo minijack on the front, and a pair of RCAs on the back. In terms of connecting to your Apple devices, Griffin offer every cable you’ll need — Mini USB to USB for Macs (USB) and mini USB to 30 pin and Lightning for iOS devices. It’s self-powering too, so you don’t need to hook it up to an external supply to keep it running. This in itself is the only issue I have with the DJ Connect, in that you can’t power your iOS devices through it. 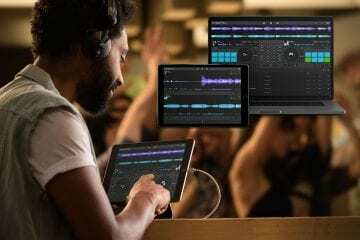 This is where the Traktor Audio 2 scores highly over the DJ Connect, so if you plan to play for extended periods of time, make sure your iOS device is fully powered first. So I plugged and I played. For Mac and iOS, it’s about as PnP as it gets. No drivers necessary, and in just about every piece of software it set itself up without an issue. If you were so minded, you could swap headphone channels for master so that the volume control works with the master out, but good luck hooking up your headphones to RCAs. It’s worth pointing out that there are limitations — you’ll have to be running at least OS X 10.6, and nothing less that iPad 2, iPhone 3G, and iPod Touch 4th gen. This makes sense, as running djay does need a bit of grunt these days. Sound-wise, it’s never going to be a high audio interface, but it’s certainly a lot better than hanging a splitter cable out of a headphone socket. 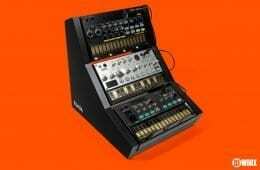 Being a bus powered device means that volume isn’t going to make your ears bleed, but you should be able to compensate via whatever your sound system is. That said, I have no complaints about the sound at all. 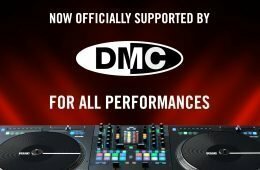 DJWORX teamster Dan Morse did try to hook the DJ Connect up to PC and Android. As expected, it sees that it’s plugged into USB, but that’s it. PC users will be better with the Audio 2. Android users… well good luck with that full stop. Ultimately, the DJ Connect does exactly what it sets out to do — it plugs and plays with Macs and iOS devices with zero fuss. 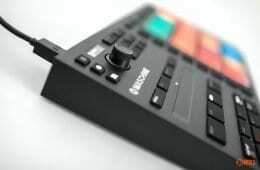 Obvious comparisons with the Traktor Audio 2 have to be made so let’s do that now. The Audio 2 wins with having dual volume controls and being able to charge through via an external power supply. That however will set you back £22, and if you want to use an Audio 2 with Lighting devices, that’s another £25 for the connector (NI state Apple only). So while the Audio 2 may at first seem to be a safer choice, there’s potentially close to £50 extra to fork out for the full benefit. So it’s not so clear-cut as to which one wins. But this isn’t about picking a winner for you — my purpose has been to check out the DJ Connect so you don’t have to, and in this respect it works a treat. Totally plug and play, and has everything you need to run with Macs and iOS devices. The real downer and potential deal breaker for a lot of people is the lack of powering through, but if you charge fully before you play, it should be just fine. And it sure is pretty too. For Mac and iOS users, Griffin just made DJ plugging and playing a lot easier. The DJ Connect looks good, works well, and doesn’t break the bank.